Happy Labor Day weekend. This will be a quick exchange before I run out the door. Oh, I’m not going anywhere for the weekend, we’re still working on potty training with Bixby. LOL. His latest update is here. I decided on shish kabobs for the recipe exchange because they are a favorite for large get-togethers. I can prepare them a day ahead and then pop them on the grill when guests arrive. They cook up quick and everyone can get theirs cooked to their idea of perfection. And if you’re lucky and everyone is staying at your house, you can form an assembly line to put them together. Pictured above is one of my go-to skewers, easy marinade and simple to assemble for a small family dinner or a big get-together. It’s equal parts vegetable oil, soy sauce, lemon juice, and toss in some crushed garlic cloves. Mix together and marinate cubed pieces of steak (sirloin works well) for at least an hour or overnight. 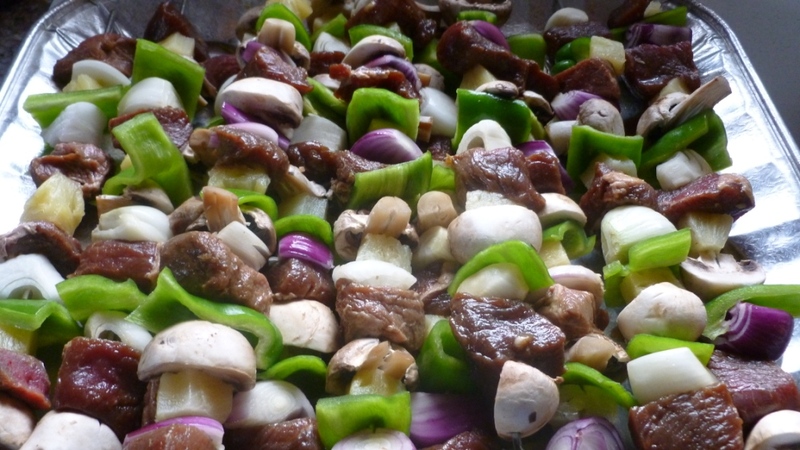 I remove the steak pieces from the marinade and then toss the veggies with the marinade quickly before alternating meat, vegetables and pineapple chunks on skewers. The ones above really need some cherry tomatoes, too. Grill over high heat, turning frequently until steak is cooked to desired style. Fajita Chicken and Vegetable Kabobs can be found here. Grilled Chicken and Papaya Skewers are here. Lamb Kabobs recipe is here. And a variety of other Marinades can be found here, to create any number of skewers to grill. What’s on your plate for the weekend? Grilling anything tasty? For tonight’s featured recipe, I thought it would be fun to make sure dessert was included in the mix. Roll strawberries in sugar, coating lightly. Alternate fruit and cake on the skewers. Place on plates and drizzle with chocolate syrup and garnish with coconut. Serve with additional syrup for dipping if desired.